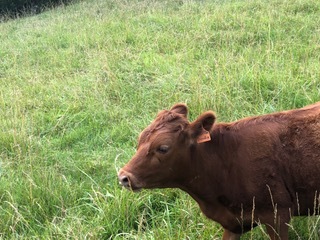 We raise a heritage breed of cattle called Irish Dexters. Irish Dexters are considered the perfect homestead cow because they can be raised for beef, milk and used as oxen! They are smaller than other breeds but they are NOT a miniature breed. They are very gentle, curious cows with great personalities. I have, in the past, raised Holsteins, Jerseys and Black Angus but Dexters are my favorite! The article is from 1980, and is obviously a bit outdated. There is genetic testing now so that the “bulldog” trait is not a worry if you are careful. Dexters have become quite popular in the last 38 years…not a problem to find them for sale anymore! I recommend you only purchase from reputable breeders! Until last Friday, we had two Dexters. 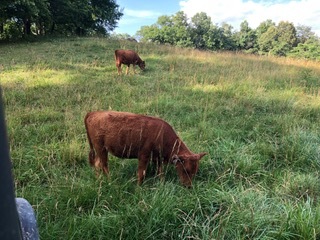 We own Dixie, a red heifer, who is bred and due in August (baby pictures coming soon) and Toolie, a black heifer, who is just over a year old. 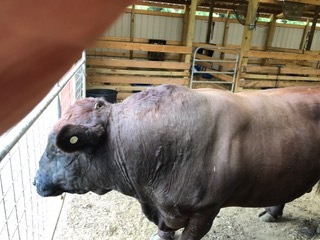 Our plan is to put Toolie with the new bull sometime in September. They need to be at least 15 months old before breeding. Last Friday the bull we purchased, along with two little heifers, were delivered. Our bull came all the way from Wyoming! He is beautiful, massive and so very gentle! Our heifers came from a breeder in Rutledge TN. Goodie bolted and ran, dragging her bright blue lead behind her. Elijah made a mad dash for the gate to the lower fields…which are NOT secure…and got it closed before Goodie could escape. Then he ran to the front gate and closed it so she couldn’t follow the lane down to the road. Goodie headed for the fence line…cows often follow fence lines…and began moving down the fence towards the corner of the field. “Easy peasy” we thought. Although we lost sight of her over a little knoll, we knew she was secure in that field and we could easily capture her. We secured the gate to the girls field and headed out after Goodie. When we topped the knoll there was no cow in sight! We walked the fence line thinking maybe she tucked in under some vines or behind some equipment. She had just been loaded into a trailer, traveled multiple highways for an hour and was unloaded into a strange place with people she did not recognize! I knew she had to be terrified. Nope! No cow. We split up to cover other fields some of us on foot, some in the Gator and some in the Kubota. We spent hours searching the entire 45 acre farm! It was as if Goodie had disappeared! Elijah even went looking for tracks along the creek, just in case she got into the lower fields, and went part way up on our mountain to see if she managed to cross the creek even though it was full from recent rains. No sign of Goodie! We went back to the trailer to unload Sonny, who had been waiting so patiently. We put him into the field with Dixie so he could eat and drink. That was easy…such a gentleman…he walked right into the field and took ownership. I believe Dixie was delighted to meet him. With all the cattle secured, the hunt for Goodie was on! The gentleman who we bought the cows from took the Kubota and went down the lane to the left notifying neighbors to be on the look out. Elijah and I went the other direction doing the same. We went down every road that led to the mountain looking for Goodie…eventually we went around the mountain to the other side looking for her. Nothing! How could a 250 pound heifer just disappear? It was like the earth opened up and swallowed her! As we continued our search on the other side of the valley, I was worried….did her lead get hung on something? Could she find water…it was 94 and humid!? Would the coyotes find her before we did? She was completely defenseless against coyotes and we have plenty of them! This went on for hours. Around 4 pm Elijah told me he was just sure that she had to be somewhere on our farm. So, we went back and started a sweep from one side of the farm to the other. We decided to move across all of the fields, with everyone concentrating on one field at a time. About half way through, Elijah and I went along a narrow stretch of land between an electric fence and one of our creeks. Elijah jumped off of the Kubota while I went to turn around. He was looking back through some bamboo that was growing up against the gate to that field that we never use. He motioned for me to turn off the engine. He had seen a flash of blue! Elijah dove into the bamboo with a bucket of feed but Goodie had no interest in feed from a stranger. Off she went. I just love cows. 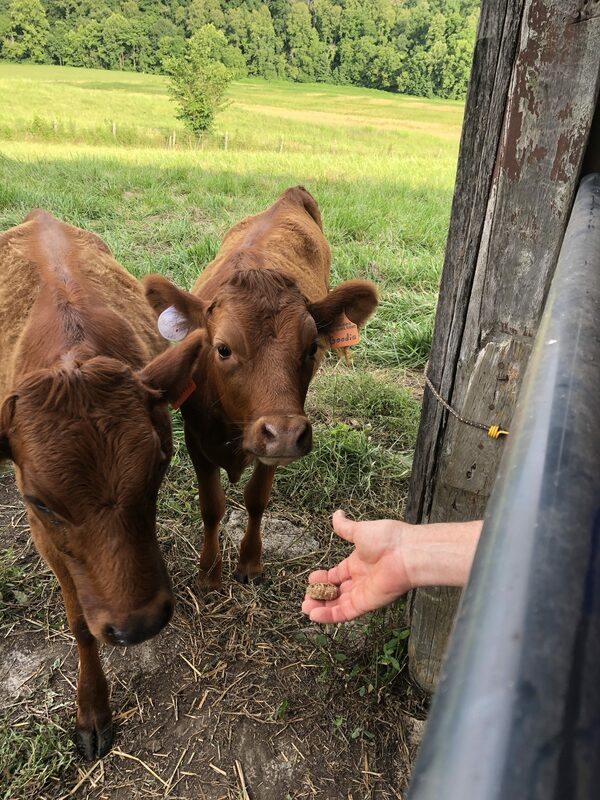 Elijah directed me to head to the other side of the farm and to open a gate close to the heifers field so he could … hopefully …guide her there. Goodie said no deal. She doubled back through the bamboo and somehow wiggled her way into the field with Dixie and the bull! Oh NO! We certainly did not want an accidental breeding at 6 months of age…not good for mama or baby! Goodie wasn’t much interested in the bull but she was certainly interested in the milk that was beginning to fill Dixie’s udder. While Goodie was attempting to nurse Dixie, Elijah managed to slip behind Dixie and grab Goodie’s halter. Finally! Elijah was able to wrangle Goodie out of the bull’s field before the bull got close to her and he began the trek to the other side of our farm (uphill…of course…) so she could join her best friend Nettie. We finished the Great Cow Chase around 6:00 pm…almost 10 hours after we started looking for Goodie. We went to bed that night (early!) knowing that all was well, the drama was over and everyone was safely secured in their own fields!